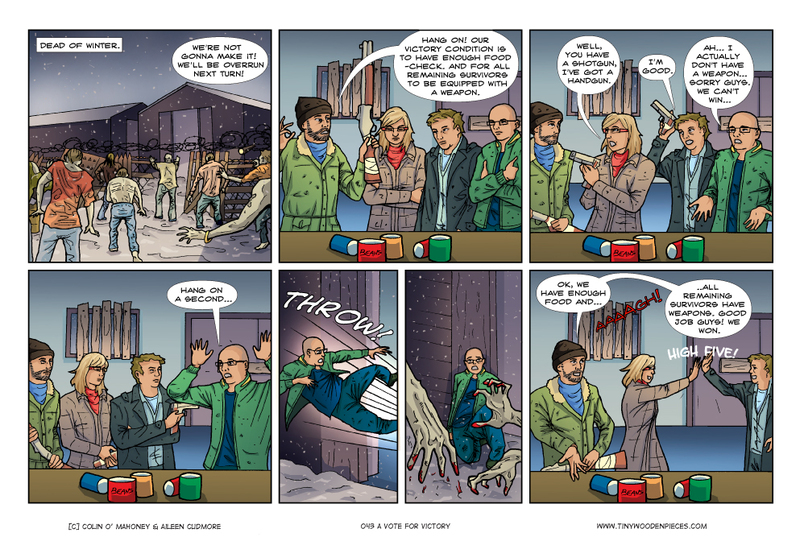 This comic is pulled from a game we played over the weekend, and is exactly why we love Dead of Winter. A little after we did our last Dead of Winter comic, the game was running a little thin for me, due in no small part to playing it at every given opportunity. Returning to it has been a revelation. I felt the game needed a rest because in terms of what players can do, it’s relatively simple. The mechanics works perfectly well, but are too straightforward to allow for the depth of strategy that I tend to prefer in games. But that’s missing the point. In Dead of Winter these mechanics are not the foundation of the game. They are simply a scaffold that supports the real game. Focusing on the mechanics is missing the point, in the same way that zombie games which focus on the zombies miss the point of the genre. Add to this the fact that the game is a knife-edge experience. You are always scrabbling to get supplies, medicine, food. There is some crisis every turn, and always, in the background but always there, are the zombies. Every character is always just one dice roll away from dying. If you get bit, that’s it. No fighting back, no second chances. The only thing that remains is how many other survivors you infect before you go. If your character does fall to a bite, or even regular old frostbite, you can always find some more followers. Quite often, you will come back from a supply run having encountered new characters to add to your own following. But of course, while new characters mean you get more actions in a turn, they also mean more mouths to feed. For everyone. What’s good for you is not always good for the group. Just another layer of tension to add, another way in which everyone is pulling in a slightly different direction. And as you get closer to the end, as the difference between life and death is smaller and smaller, what you are willing to do to survive gets worse and worse. And the game will make you do terrible things. It revels in it. As you play the game more, it becomes obvious that this is what it is designed to do. Dangle victory in front of you and then ask ‘what would you do to get it?’ What would you do to helpless survivors? What would you do to your friends? Dead of Winter understands the zombie genre, and uses it to create a tense, unique, dark, and utterly memorable experience. The term is often loosely thrown around, but the game truly is a Pandora’s Box, but one which you will want to keep on opening.